Where is the nearest carrier? is often the first question from a President when a crisis erupts overseas. A powerful instrument of diplomacy and military might, the Navy’s carrier battle group has been the United State’s reaction-force-of-choice since World War II. Collectors, naval and aviation enthusiasts all react in a similar fashion when William S. Phillips turns his painter’s eye on these seagoing airfields. 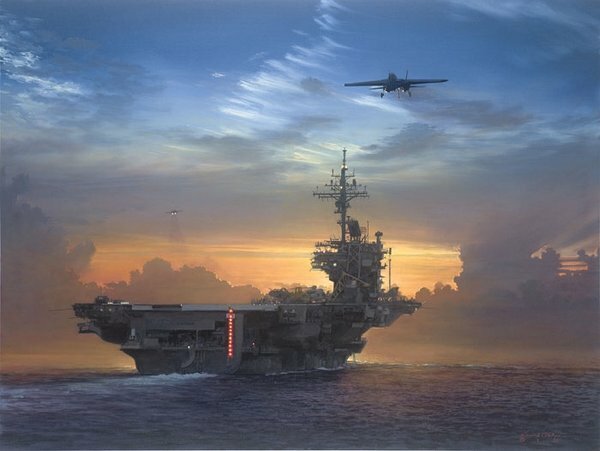 All eight of his previous Fine Art Editions featuring carriers have Sold Out at the Publisher and are only available on the secondary market.